Tặng áo mưa cao cấp... nhanh tay số lượng có hạn..!!! Loa Creaative SoudnblasterX Katana Âm thanh trung thực, đỉnh cao về thiết kế với công nghệ đèn Led Các Katana kết hợp các hệ thống chiếu sáng Aurora phản ứng, nơi mà cơ sở của nó được xếp với 49 đèn LED có thể lập trình . Cũng giống như mỗi Hamon độc đáo của thanh kiếm Nhật, Aurora hệ thống chiếu sáng Reactive lấy 16,8 triệu màu sắc cho bạn tùy chỉnh các hiệu ứng ánh sáng không khí để tạo tiểu sử độc đáo của riêng bạn khi chơi game cũng như lúc bạn xem phim. 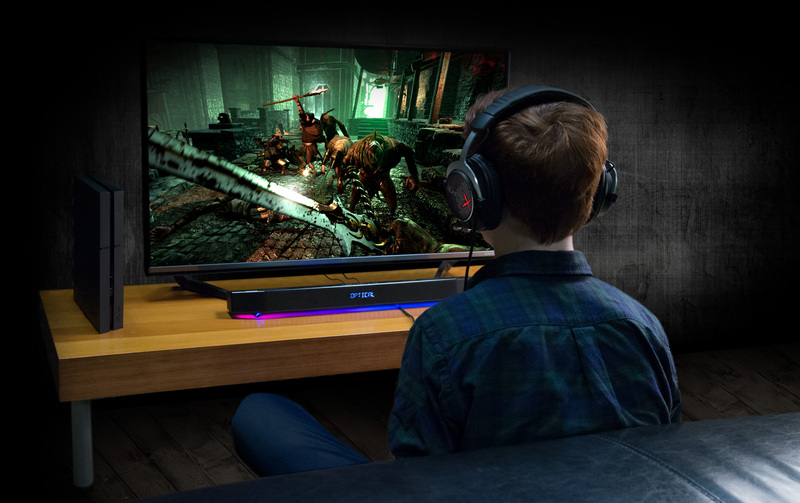 The Katana gives you an immersive audio experience for your games and movies with the BlasterX Acoustic Engine and Dolby Digital 5.1 Decoder. This audio system embodies the perfect combination of our most powerful 24-bit high resolution DAC and sophisticated 5-driver system. Housing a tri-amplified design where the 5 drivers are individually powered by DSP-controlled amplifiers, the Katana delivers ultra-precise audio at each part of the audio spectrum. Equipped with a plethora of connectivity options, you can trust the Katana to be one of the most versatile and most powerful speakers to ever grace your desktop. 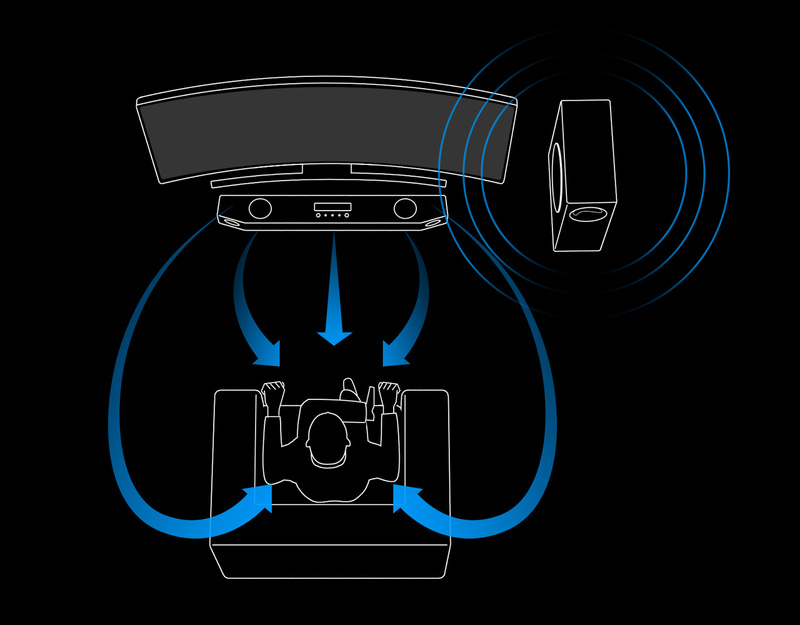 The Katana houses a 5-driver design - two up-firing midbass drivers and two high-excursion tweeters in the soundbar, and one long-throw driver in its subwoofer. The highly efficient 2.5″ midbass drivers housed in an optimally tuned ported enclosure pump out clean, transparent midrange and dynamic midbass. Directing the audio upwards also provides for a wider soundstage that doesn't require the listener to be situated in the audio sweet spot. The high-frequency drivers feature inverted alloy dome diaphragms and wide polymer surrounds for low-resonant frequency and extended low-frequency response. 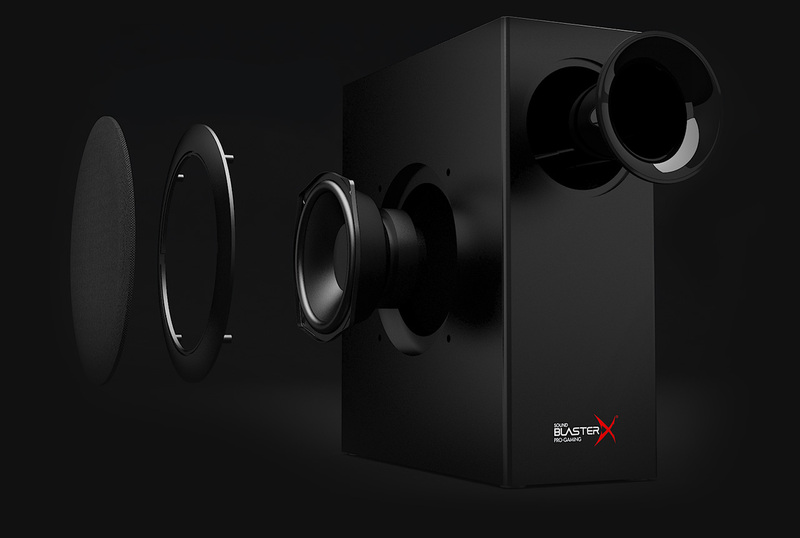 These high-excursion tweeters allow us to cross them to the midbass at a much lower frequency than conventional tweeters, resulting in seamless driver integration and uncompromising clarity. The Katana utilizes a game-changing tri-amplified design with a total output of 75RMS/150W Peak Power to deliver room-filling audio, with uncompromisingly clear, high-definition, well-balanced audio and deep resonating bass. With the tri-amplified design, the amplifiers are controlled by our proprietary multi-core Digital Signal Processor (DSP) - two dedicated to driving mids, another two dedicated to deliver the high frequencies, and one dedicated to churn out heart-thumping bass. From traversing through ravines to bullet-fast evasive maneuvers, you can hear all the details that other speakers fail to deliver. In addition to powering the tri-amplified design, the Katana features our award winning proprietary multi-core DSP that is capable of producing 24-bit high-resolution audio for lossless, crystal-clear and impressive room-filling sound. It is a certified Dolby Digital decoder that converts analog sound (stereo or 5.1) from an optical source into digital 5.1 configurations at up to 24-bit 96kHz. 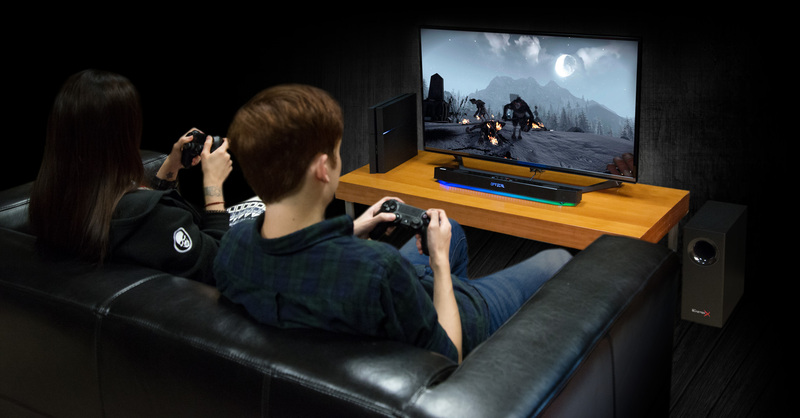 When connected via optical-in, the Dolby Digital-certified Katana delivers realistic digital 5.1 audio, giving you the most for your console gaming and movie nights. Play your entire music collection3 directly from the Katana via your USB Flash Drive that contains your favorite songs and press the Play button to enjoy a fantastic listening experience. You may also refer to your playlist from the Sound Blaster Connect4. You don't have to wake up the entire house to be a late night gamer. With the headphone jack and microphone inputs, the Katana works with most headphones and headsets, so you can conveniently put your best game forward, even when everyone else is in their deep slumber. Sit back and enjoy your movie. 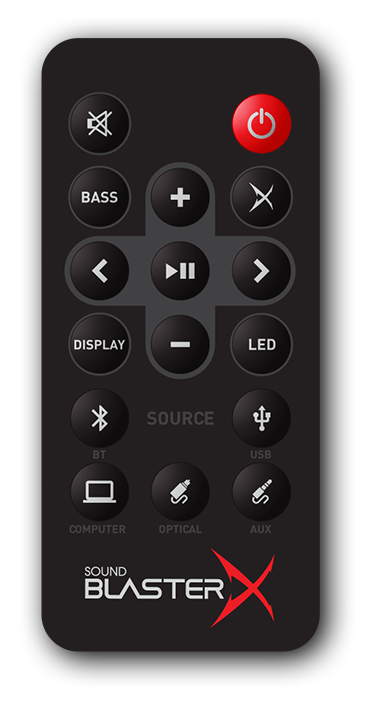 The Katana comes with an IR Remote Control, so you can have access to all the controls at your fingertips. 1 Works for USB connection to Windows PC. 2 Available for PC and Mac. 3 Supports MP3 and WMA up to 320kbps and FLAC up to 1.3Mbps. Compatible with USB thumb drive up to 128GB formatted in FAT16/ FAT32/ exFAT. Does not support WMA Pro/Lossless. 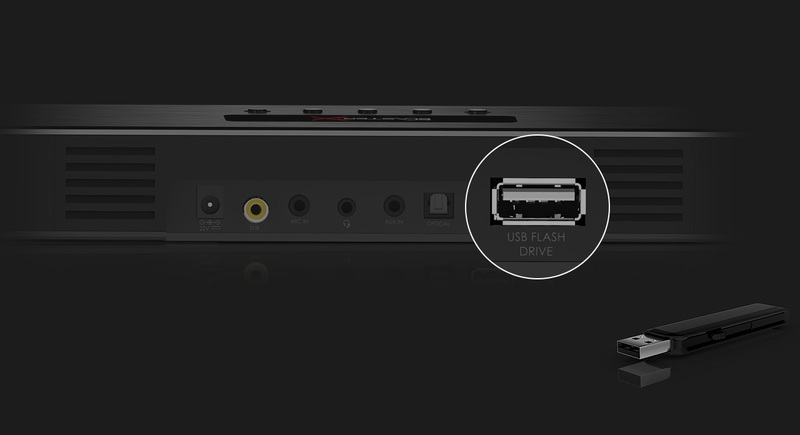 4 Sound Blaster Connect is available on Windows OS only.